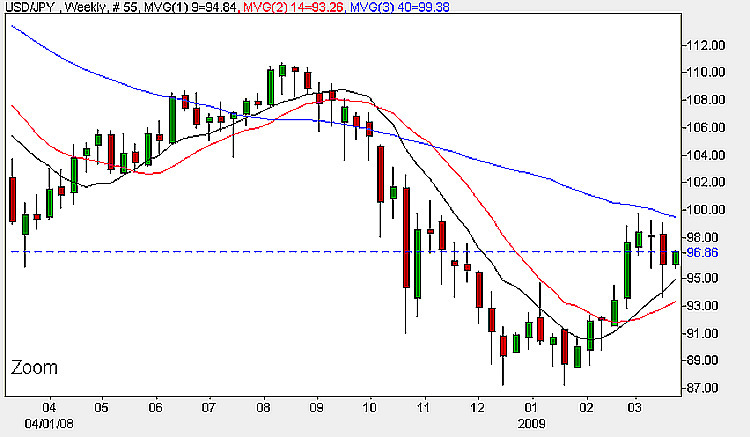 Trading any yen cross at this time of year can be quite tricky as we approach Japan’s end of year on 31st March. Whilst last week’s candle confirmed the short term bearish sentiment it was less than convincing for two reasons: firstly the lower shadow was extremely long and almost the same as the body of the candle suggesting that the bulls have not yet thrown in the towel. Secondly, the low of the week bounced conveniently off the 9 week moving average thereby providing a modicum of support which has been reflected in this morning’s trading session. Whether this continues into the afternoon session is debatable given that we have two important items on the fundamental news agenda. We start with Treasury Secretary Geithner’s speaking shortly in the US about a plan to relieve the banks of their toxic assets, a process which inevitably involve printing dollars which could weaken the currency even further. Later in the day we have the minutes from the Bank of Japan which explain the reasons for their latest interest rate decision. My trading suggestion is to wait until tomorrow by which time the market will have had a chance to absorb both pieces of fundamental news. In addition I have been working on COT data for the Japanese Yen which I will publish later today and this may give us some clear guidance for the medium to long term direction for this pair. In the meantime you can access live currency news, live currency charts, the latest support and resistance video by simply following the appropriate links.